There are two-and-a-half people in the “Lost” column that I am sad about: Milton Bradley, Duaner Sanchez, and half of Antonio Perez. There are about six on the “Added” side that make me happy (actually, four and four halves): Rafael Furcal, Nomar Garciaparra, Kenny Lofton, and Bill Mueller, with half-happy for Sandy Alomar, Andre Ethier, Jae Seo, and Brett Tomko. The only guy in the Added column who doesn’t score at least a partial “Woohoo!” is Tim Hamulack, just because it’s hard to get excited for a 29-year-old rookie with a career ERA of 23.14. But otherwise, that Added list makes me pretty happy. On the other side, you have five guys I am happy to see go: the three catchers (Paul Bako, Jason Phillips, and Mike Rose), along with Jason Grabowski and Jose Valentin. 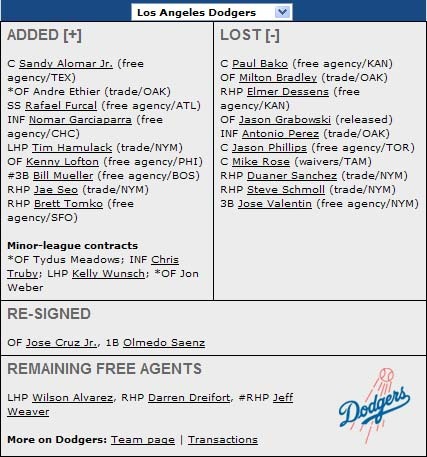 The bottom section is for remaining free agents, and it includes Jeff Weaver, who as of last night cannot sign with the Dodgers until May 1, which means he is done with Dodger Blue. Weaver would have been nice to have back, but I am not heartbroken about his departure, and not nearly as sad about him leaving as I would have been about him staying for Scott Boras dollars. And Wilson Alvarez and Darren Dreifort? So long, farewell, etc. When you look at these lists, it is pretty much guaranteed that they will be better than they were last year. If they can stay healthy, they look like the team to beat in the crappy NL West.